that worked from the port during his childhood years. 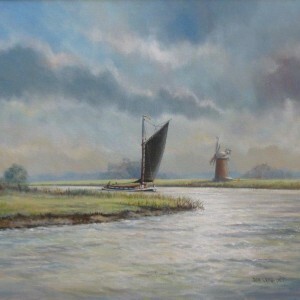 His own early working life was spent on the barges used to maintain the Norfolk Broads. During that time he taught himself the mystic craft of making ships in bottles, this was followed by experiments with canvass and brush, and in a very short time there was sufficient demand for his work, to consider it as a full time career. Since then Joe’s vivid studies of fishing vessels have found their way into ship’s ward rooms, company boardrooms, maritime museums, as well as onto walls of private collectors all over the world, they have also been featured in “Sea Breezes” and other magazines. As time went by, Norfolk wherries, steam trains, rural landscapes, and aircraft paintings, extended his artistic appeal to a wider audience, including many American 5th Air Force veterans, who have commissioned studies of the “Fortresses” and “Liberators”, in which they flew from East Anglian bases, during World War Two. Joe Crowfoot’s work has been exhibited throughout the eastern counties, as well as London’s Mall Gallery.